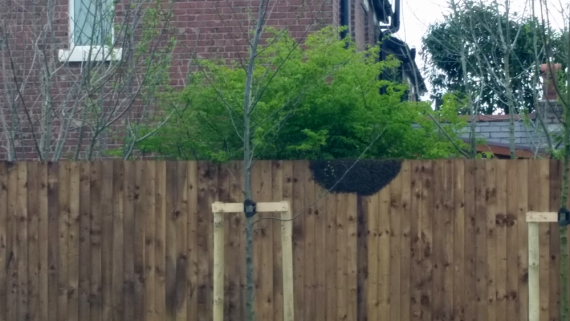 At 5 pm this evening the phone rung, ( Ring Ring Ring ), do you rescue bees?, yes we do .. there are bees on our fence ( I take the address and post code ) immediately I am on my way, approx 5 miles away .. ha ha its on my patch, considering we can travel up to 50 miles away from base. 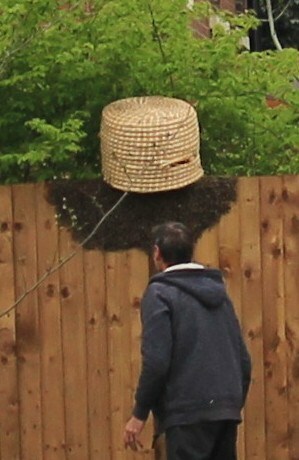 Here I put the large skep on top of the fence .. balancing on the edge of the fence lucky a twig is holding it in place. Skeps where used to keep bees in approx 1800’s, bees swarm normally due to overcrowding. Note … no bee suit on .. when bees swarm they consume 3 days of honey so they are very placid. At this time I saw the queen and put her in a cage. she had a white dot on her .. so that tells me it came from a fellow beekeeper ( finders keepers ) so straight away I popped her into the skep .. so the rest of the bees will follow. 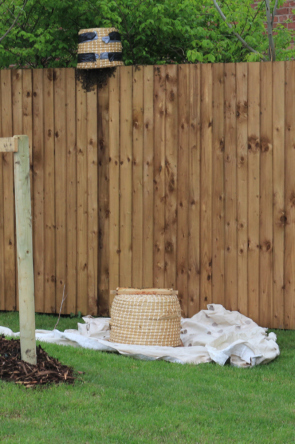 Just hanging about now trying to catch as many stragglers as possible using a smaller skep now on the fence …. after a hour I was back at home loading up a empty hive .. and then off to one of Adopt-A -Hives apiary’s where they where hived and fed. What a lovely end to a May day holiday.